Having the right supplies on hand will go a long way to make sure your move to Thunder Bay goes as smoothly as possible. Preparation is Everything! Before you begin you will want to make sure you have everything you need to pack your items securely. Stock up on many different sizes of cardboard boxes, bubble wrap, packing paper, lots of wide packing tape, scissors, and markers to label your boxes. It’s also handy to have a screwdriver and a couple sizes of allan keys for when it comes time to disassemble your furniture. A tip to remember: When packing your boxes, don’t be tempted to stuff everything you can into the largest size. If you’re not using movers, you’ll need to lift these boxes, and they can get heavy quickly. Make sure you can lift the box without straining yourself, and split things into smaller boxes to optimize the weight. Also, remember to leave yourself enough time to pack everything carefully, make a list of where you’re putting your most important items, and you and your family (not to mention your breakables) will get through your move in one piece. Have soft pads on hand to put underneath furniture to prevent it from getting scratched. Moving pads are available at many hardware stores and some can even be rented along with the moving truck. 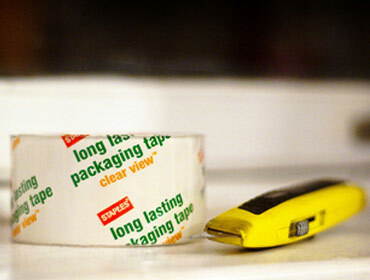 Soft foam that you can tape to any sharp corners is another helpful addition. A covering for your mattress, either a dedicated mattress cover or some other large bag, will help keep it clean in the truck and in the unloading process. Strap down anything that can be strapped, and do your best to minimize movement and shifting in the truck. Your preparation in packing items carefully will make this step much easier. It’s good to have scissors and box cutters on hand for getting all of that tape off, and some towels and rags will be helpful for quickly cleaning anything that got mussed on the drive over. One element of the unpacking process that is easily neglected is time! Unpacking in a rush is a surefire way to end up stressed, frantic, and anxious of not finding what you need. Unpack the most important items first, such as kitchen tools and dinnerware, and anything you need for your bedrooms. If you have packed your items and labeled your boxes carefully at the time of the move, the unpacking process will go smooth, and you will have your new home up and running in no time, hassle-free.